As a number of recent high profile issues have made clear, preserving Toronto’s unique heritage is an ongoing effort full of challenges. However, it’s rare that we stop to celebrate all the things that are right with the city’s heritage and history scene. 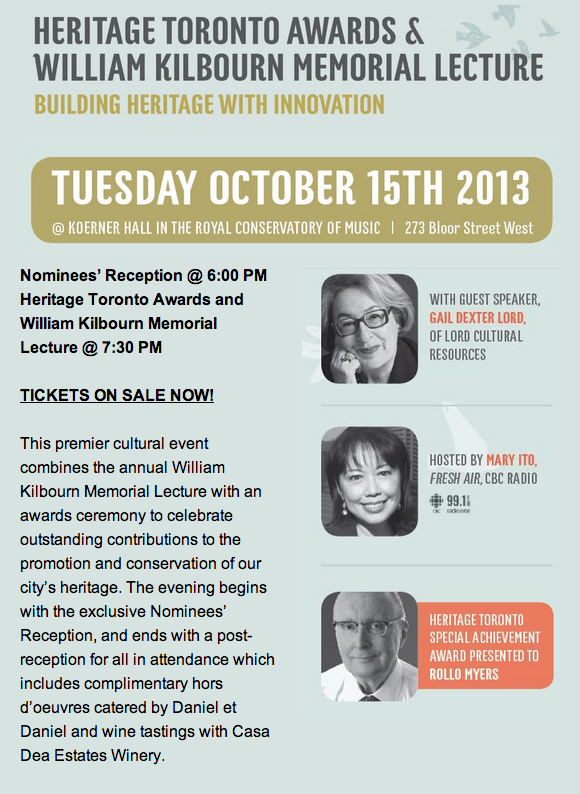 Heritage Toronto’s flagship annual public lecture, the William Kilbourn Memorial Lecture, is also delivered at the Awards. The lecture is named for William Kilbourn, an academic, writer, politician, mentor and champion of the arts and humanities in the city. In his memory, each year a speaker is chosen to reflect the passion and dedication to our city that he inspired. Previous speakers have included David Crombie, Adrienne Clarkson, David Mirvish, John Fulford, Ursula Franklin, Peter Oundjian, Cameron Bailey and Chief Bryan Laforme of the Mississaugas of the New Credit First Nation. 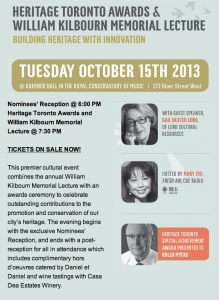 The 39th Annual Heritage Toronto Awards & William Kilbourn Memorial Lecture begins with a Nominees’ Reception at 6 p.m. and ends with a post-reception for all in attendance. The Awards and Lecture begin at 7:30 p.m. Both receptions are catered by Daniel et Daniel with complimentary Casa-Dea Estates Winery wine tastings. Woodcliffe Landmark Properties is proud to be Presenting Sponsor and The Restoration Council of Ontario (Carpenters’ Union Local 27 & Restoration Local 598) are proud Nominees’ Reception sponsors. Ticket prices start at $15 and can be purchased online at performance.rcmusic.ca, by phone at (416) 408-0208, or in person at the Royal Conservatory box office. The Community Heritage category nominees this year are varied and unique; these volunteer groups are developing interesting and thought-provoking programs to build appreciation for heritage in their respective communities. The Cabbagetown Preservation Association has its unique Cabbagetown People Program documenting the lives of over 40 influential Canadians who once called Cabbagetown home. The Riverdale Historical Society has produced public lectures, heritage plaque installations, walking tours, and various publications including a quarterly newsletter and sponsorship of two historical books on Riverdale. The Real Canadian Portuguese Historical Museum in Etobicoke has gathered a large collection of artifacts and organized exhibits to present Portuguese heritage in Canada. They’ve also produced a video documentary in Portuguese and English featuring interviews with pioneering members of the community as they celebrate 60 years of Portuguese emigration to Canada. In Scarborough, the Friends of the Guild Park and Gardens work to increase public awareness of the Park’s history as the home of the Guild of All Arts and the Guild Inn and to promote revitalization of the site. The organization has recruited over 100 members, built an effective Facebook page, and coordinated tours that attract many visitors to the area. Leaside established the Leaside 100 Committee to plan a series of events in celebration of the neighbourhood’s incorporation as a town in 1913. Their archival exhibit – “The Layers of Leaside” – traced the history of the Town’s industrial and railway roots through six key historical layers of settlement. 28 Seconds: A True Story of Addiction, Tragedy, and Hope, revolves around former Attorney General of Ontario Michael Bryant’s involvement in the death of cyclist Darcy Allan Sheppard on August 31, 2009 in Toronto. A memoir defined by music, 1982 recounts Jian Ghomeshi’s life as a 15-year-old “Persian-Canadian New Waver” growing up in Thornhill. My Canada includes Foie Gras: A Culinary Life by food columnist, restaurant critic, and cookbook writer Jacob Richler profiles the development of restaurant scenes in Canadian cities, including Toronto, and explores Canadian food via recipes and the chefs behind them. Full Frontal T.O. : Exploring Toronto’s Architectural Vernacular provides a visual history of Toronto streetscapes over three decades. At its heart are about 400 photographs by Patrick Cummins. Shawn Micallef contextualizes the subjects, commenting on how the photos document aspects of the city’s built form and cultural development since the 1970s. College Street, A Study: Part One, Loft Buildings on the South Side 1903-1915 has contemporary and archival photos and architectural drawings of 12 loft buildings along College Street. The buildings are recognized as unique heritage assets through their materials, design, and historical context. They are also considered together to underline how Edwardian lofts’ style and versatility have shaped our city on College Street and beyond. Redcoated Ploughboys: The Volunteer Battalion of Incorporated Militia of Upper Canada 1813-1815 tells of the Volunteer Battalion of Incorporated Militia of Upper Canada during the War of 1812. It follows the Battalion through training and early success to the Niagara Campaign of 1814. In Vanguard of the New Age: The Toronto Theosophical Society, 1891-1945, Gillian McCann illustrates how and why a small group of influential Torontonians – including some Group of Seven artists – adopted a new religion imported from England and America that blended elements of Hinduism, Western occultism, and enlightenment science. Commemorating the Battle of York: The War of 1812 Bicentennial Commemorative Booklet by Robyn Posner was published as part of the St. Lawrence Market Neighbourhood BIA‘s commemorations of the 200th anniversary of the War of 1812. The booklet introduces the War of 1812, the Town of York (now Toronto), and the Battle of York and its impact on the town. The booklet also has a map of historic sites in Old Town Toronto. Historical Walking Tour of North York Centre: Celebrating the 25th Anniversary of North York Central Library, 1987-2012, by Mary Ann Cross, Geoff Kettel and Barbara Myrvold, was produced for the 25th Anniversary of the North York Central Library by the Toronto Public Library Board in partnership with North York Historical Society, North York Community Preservation Panel and Gibson House Museum. The booklet has a detailed walking tour of the neighbourhood highlighting everything from Aboriginal settlements to modern office towers. Historicist: The Telegram Sets, the Sun Rises, a blog post by Jamie Bradburn, recounts the end of the Toronto Telegram newspaper and the subsequent founding of the Toronto Sun. Historicist: The “Manifest Destiny” of North Toronto, a blog post by David Wencer, was published on the 100th anniversary of the annexation of North Toronto. The article traces North Toronto’s history starting with the merging of the villages of Davisville and Eglinton. Curse of the Axe, a documentary written and directed by Robin Bicknell and produced by Elliott Halpern and Elizabeth Trojian, all of YAP Films, Inc., traces the investigation of an iron object buried in a Huron-Wendat village 100 years before European contact. Another documentary, Explosion 1812, tells of the destruction of Fort York’s munitions magazine during the Battle of York (1813) and explores the influence of that explosion on subsequent War of 1812 events. Uncle Bob and His Vietnamese Children is a documentary by Sue Chun telling the story of Robert Sargent (“Uncle Bob”) and his efforts integrating Vietnamese immigrants into Toronto. The Italian Canadians as Enemy Aliens: Memories of WWII website was launched by the Columbus Centre of Toronto to raise awareness of a previously little-known event: during World War II, 30,000 Italian Canadians were designated as “enemy aliens”, and around 600 were interned in remote camps. Textile Museum of Canada‘s TXTilecity is a website / free mobile app showing the significance of textiles in shaping the city’s social, cultural, economic and architectural heritage. Spadina Museum Historic House and Gardens, operated by the City of Toronto, has completed comprehensive interior restoration and preservation work which harmonized the period of interpretation of all the museum rooms to be the period of the 1920s and 1930s. The Richmond Adelaide Centre project involved the partial restoration and rehabilitation of a Modern-style downtown office building built in 1954 and designed by architect Peter Dickinson with engineer Morden Yolles. The Toronto District School Board redeveloped the North Toronto Collegiate Institute site to include a new secondary school building, two condominium towers, underground parking, and a playing field. The new school building has a unique “heritage courtyard” in the centre. Three buildings that made up the Hinde and Dauch Paper Company Power House, originally constructed in 1910-12 as a storehouse and boiler houses, were restored and adaptively reused. Much of the work focused on masonry repairs, particularly to the two chimney stacks which are landmarks in the area. 85 Laird Drive was originally a Locomotive Shop for Canadian Northern Railway Eastern Lines. The building was retained in its entirety, its open interior adapted to be a grocery store. The adaptive reuse of Maple Leaf Gardens, which is a National Historic Site, saw the original interior replaced with new floor levels to accommodate a grocery store at street level and a student athletic centre above. A new ice rink was installed on the top floor beneath the original arena roof. The marquee was restored to follow the original design. The Lassonde Innovation Centre‘s project involved the adaptive reuse of unused attic and rooftop areas of the University of Toronto’s designated Mining Building that was constructed in 1905. New spaces created included graduate student offices, a seminar room, and a studio divided into study areas by existing masonry walls and heavy timber trusses. The Victoria Lofts project is a residential conversion of the 1890 Victoria-Royce Presbyterian Church, designed by the architecture firm of Knox and Elliot. Character-defining elements such as the “muscular” Romanesque Revival form and masonry exterior were preserved while adapting the interior for residential units. Visible from the Don Valley Parkway, Todmorden Mills‘ papermill chimney has suffered deterioration likely due in part to exposure to de-icing salts from the highway. Restoration of its chimney included importing closely matching brick from England and the replacement of the outer layer of brick in the chimney’s top five metres. The Dineen Building, constructed in 1897 for the W & D Dineen Hats and Furs Company, underwent extensive exterior restoration and layers of successive interior renovations to reveal original ceiling heights, iron columns, crown moldings, and several historic J.J. Taylor safes. 11 Division at 2054 Davenport Road undertook an adaptive reuse project which involved integrating a former school building into a new police station. Carleton Village School, built in 1913 in Edwardian Neo-Classical style, was retained while later additions were demolished. St. Michael’s Cathedral, Toronto’s oldest Roman Catholic Church, took on Phase IV of the Renewal Master Plan. It involved the masonry conservation of the west façade and the 275-foot tower. In order to match original materials, replacement brick was imported from England. Earlier unsympathetic repairs were reversed and original features like pinnacles, finials, and flying buttresses were re-created to restore the spire and tower to their original appearance. The R.C. Harris Water Plant, which provides 47% of the GTA’s water supply, needed extensive restoration on various areas, including exterior brick and stone masonry, interior brick and marble, and the wood window and doors. The building was constructed in 1932 in the Art Deco Style to the designs of architect Thomas C. Pomphrey. The Mjölk House project involved the restoration of a rare pressed metal commercial façade and the interior renovation of a three-storey 1889 building in the Junction. Work included the reconstruction in steel of the structure of the oriel window to its original dimensions, the replication of deteriorated metal components and the reconstruction of the façade, including all decorative details, according to the original design. The former Lombard Street Fire Hall / Second City Theatre has been adaptively reused by Complections College of Makeup Art & Design. The building was designed by architect David Roberts Jr. and constructed in 1886. This project involved partitioning upper floors into office space and classrooms. The principal room on the main floor was renovated to be a retail space. Exterior brick was repaired and the original entrance hall and staircase were repainted. Heritage Toronto is a charitable arms-length agency of the City of Toronto established in 1949 to promote a greater appreciation for the city’s rich architectural, cultural, archaeological and natural heritage. Through partnerships with local community groups and volunteers, Heritage Toronto provides city-wide programs and services. Toronto is a great place to live. Thank you for all your work!